Jennie Dembowski remembers dreaming of which petit fours should would order from her mothers petit four mail order catalog. 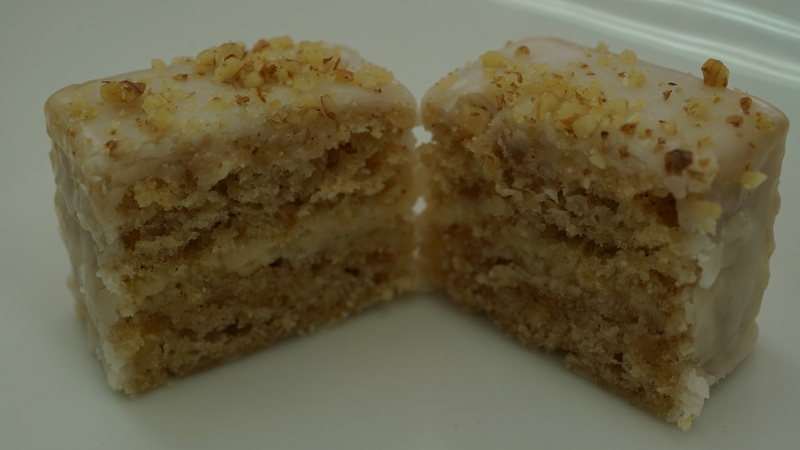 For the "Patisserie Week" Signature bake, Jennie combines some of her favorite flavors, including cinnamon, into her Honey Walnut petit four recipe. The honey walnut cake with cinnamon buttercream, walnuts and honey is filled with honey and cut using circle and square cutters created by her husband. Watch the full episode of "Patisserie Week" from The Great American Baking Show Season 2 episode 7. 1. Preheat oven to 350º F / 160º C. Toast walnuts for approx. 8-10 minutes. Reserve 3 tablespoons as garnish. 2. Line a 10" x 15" baking sheet with parchment paper and coat with baking spray. 3. Whisk flour, baking powder, baking soda, cinnamon, and salt in medium bowl. 4. Cream butter with both sugars until light and fluffy. Add eggs one at a time and beat thoroughly until combined. 5. Whisk together honey, milk, and vanilla extract. 6. With mixer on low speed, alternately add flour mixture and milk mixture to creamed butter and sugar mixture, starting and ending with the flour mixture, and beat just until combined. Fold in toasted walnuts. 7. Spread onto prepared sheet pan and bake at 350º F / 165º C for 20-25 minutes. 8. Invert cake onto cooling rack and refrigerate to cool completely. Cream butter, then add sifted powdered sugar, vanilla extract, 3 tbsp of heavy cream, honey, and cinnamon and beat until light and fluffy. Add additional heavy cream if needed to reach desired consistency. 1. Once cakes have cooled flip them onto parchment paper lined counter. 2. Cut cake in half to create two even pieces (one top and one bottom). 3. Spread honey glaze on one half of cake, then top with honey buttercream filling. 4. Place second half of cake on top of first half of cake. Press gently to set filling. 5. Place cake into freezer and freeze for 10 minutes before cutting into desired petit four shapes. 1. In a medium sized glass bowl, sift the confectioner's sugar then add the corn syrup, hot water, and vanilla extract, and whisk until smooth. 2. Place the bowl over a pot of simmering water, and stir until smooth. Check temperature (to be anywhere from 92º-100º F), then add the white chocolate chips to bowl, stirring until melted. 3. Turn down heat and keep bowls on top of two steaming water pots to keep the icing from setting up. 4. Remove cut/shaped cakes from freezer and ladle fondant on top of cakes. Sprinkle with reserved chopped walnuts.